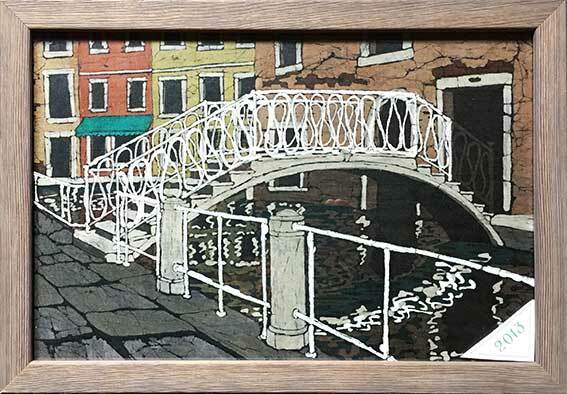 One of a series of Venice bridge studies, this small back-lit original shows one of the many pretty bridges with intricate ironwork that you find in the Dorsoduro area of the city. This study though shows an example of the pitfalls of working in Batik! Whilst waxing the white areas of the bridge, I (for some unknown reason) missed the last section of the railings on the bridge. I didn't realise my mistake until several colours down the line when, with much cursing for my stupidity, I then waxed in the missing railings - but they are now brown. The Batik process is very unforgiving. Once you've missed a bit, it's too late - you can't go back! I was actually rather pleased with the way the whole study had turned out, with the brown railings appearing to be in deep shadow, so this time I think I got away with it! I use LED strip to back-light my work. On this one, I have purposely placed the lights along the railings and in a curve over the bridge, thus drawing your eye to it. I have left the area under and below the bridge unlit, to be darker. So you see, I am still designing the finished picture right up until this last stage.